Hi friends - I'm back from New York, and excited to be back in my own kitchen. I miss it when I travel! 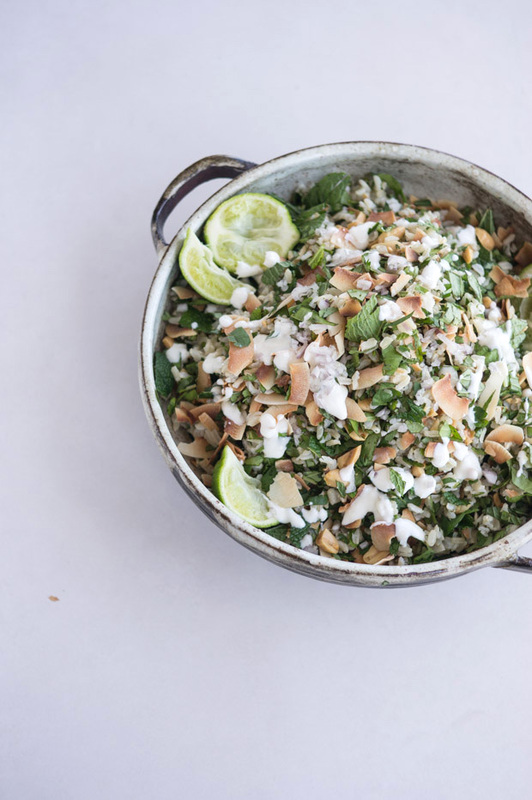 This was first up, and I'm telling you, you're going to want to keep this herb-packed rice salad in your back pocket this summer. It's for those occasions when basil, and mint, and cilantro are booming in your garden, or at the market. And it's a great way to use leftover rice (or other favorite grain). I'm not shy with the amount of herbs I use in relation to the quantity of rice here, and I also like to deploy a generous amount of toasted coconut and peanuts. A bold boost of lime pulls everything together and keeps it all bright. 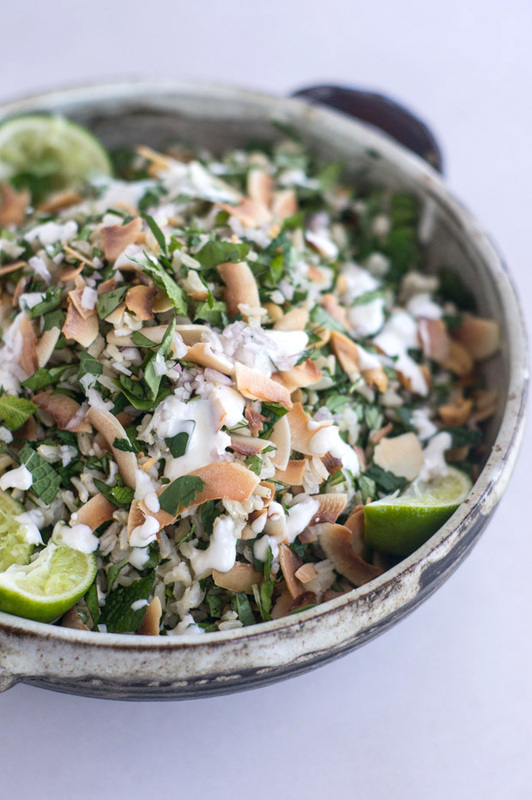 A couple side notes - aside from the chopping of the herbs, you can prep the components of this salad a couple of days ahead of time - rice, coconut, peanuts. I like to make it with brown jasmine rice, but it might also be nice with any number of other grains - farro or quinoa come to mind. I make note of this in the recipe below, but adding roasted cherry tomatoes later in the year, when they're in season, will really take this over the top in a great way. Enjoy! When they're in season, roast halved cherry tomatoes, and add them to the salad just before serving. *You can use whatever rice you have on hand, but I like to use the wonderfully fragrant brown jasmine rice for this salad. Ideally, you're going to want to toss this salad, just before serving. It keeps the herbs bright, and green. 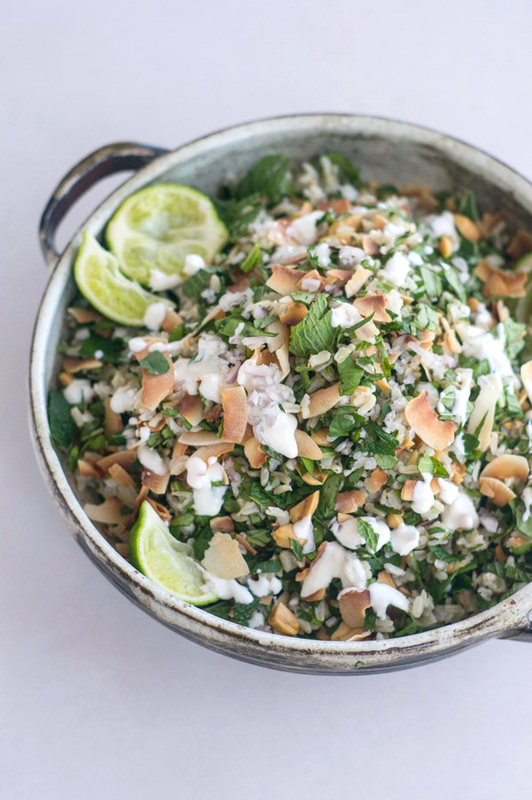 In a large bowl, combine the rice, coconut, peanuts, mint, basil, cilantro, and shallots. Season with the lime juice, and salt. Toss again. Mash the garlic clove into a paste with a generous pinch of salt. Whisk the salted garlic into the yogurt, and drizzle generously over the salad, serving the rest on the side.